Half time maid and 24 hours security guard. Mobile phone with local number provided. Oberoi Street with some of the most upscale shops, bars and restaurants in Bali. The villa has 2 master bedrooms and a smaller one that can accommodate two adults. They are all air-conditioned and equipped with LCD TV with DVD player. The two main bedrooms have ensuite bathrooms, one of them even has a beautiful terrazzo bathtub lined by exotic plants and trees where you can relax while gazing at the sky. Kallayaan also has one small bathroom at the entrance. 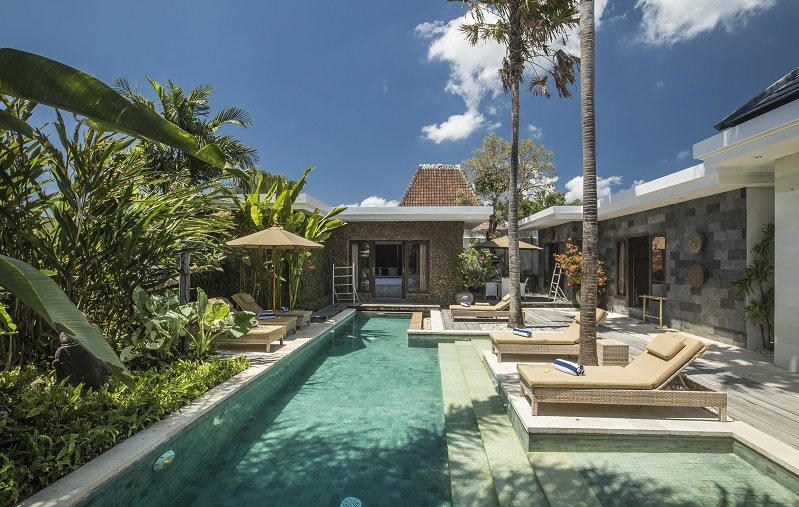 You will enjoy all the modern comfort (LCD TV, cable TV, DVD Players, Wi-Fi etc ...) and the tranquility of the place will allow you to revivify yourself in order to fully appreciate all the charms of Bali. You have review for Villa kallayaan?